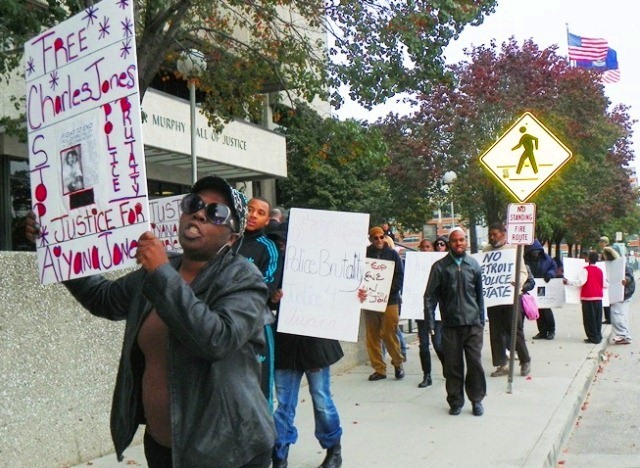 Aiyana Jones’ grandmother Mertilla Jones marches Oct. 21, 2013 with familes of Davontae Sanford, Lamar Grable, Cornell Squires, and other victims of Detroit police killings and brutality. 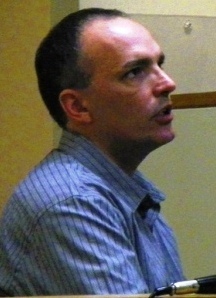 Schlenkerman at Charles Jones exam Jan. 26, 2012. 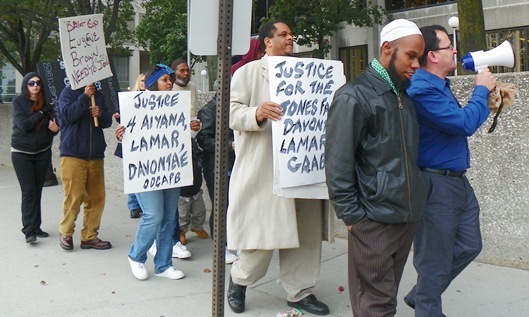 DETROIT – As the first-degree murder trial of Charles Jones and Chauncey Owens begins next week, VOD has learned that the chief witness against Jones, “jail-house snitch” Jay Schlenkerman, as Jones’ attorney termed him, was charged with three more serious felonies in April, adding to a long list detailed in earlier VOD stories. Schlenkerman pled guilty to the offenses “Operating while intoxicated,” “Police Officer—fleeing—Third Degree; and “Operating-License Suspended, Revoked, Denied” in front of Wayne County Circuit Court Judge Michael Callahan in July, according to court records. But he was mysteriously allowed to withdraw his guilty plea in August, then later had his bond reduced from $60,000 to $5,000 and was freed on tether in September. Click on Schlenkerman ROA to read details of charges and actions against Schlenkerman. Previous charges against ‘jail-house’ snitch Jay Schlenkerman, per court records. The statute cited in the second charge indicates that it involved a vehicular collision. Schlenkerman’s original attorney withdrew from his case Sept. 20, and was replaced by court-appointed attorney Ronald P. Weitzman. 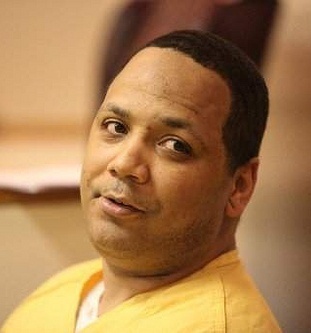 An advocate for Davontae Sanford noted that the withdrawal of Schlenkerman’s guilty plea contrasts harshly with Sanford’s case, based on a confession made at the age of 14 to four drug-house murders in 2007. An Appeals Court just ruled, over the objection of the prosecutor, that Vincent Smothers, who has confessed to the killings and exonerated Sanford, must be allowed to testify at Sanford’s next plea withdrawal hearing. “The disparity vis-a-vis Davontae Sanford in [the prosecutor] fighting to keep his ill-advised induced plea in place while Mr. Schlenkerman’s request was not even contested speaks volumes of the shady deals they cut with the real criminals at that corner on St. Antoine!” said paralegal Roberto Guzman. Assistant Prosecutor Maria Miller, chief of communications for Wayne County Prosecutor Kym Worthy, had not responded to a request for a statement before this story went to press. Schlenkerman’s attorney Weitzman said he could not comment due to attorney-client privilege. Roberto Guzman leads chants during joint Oct. 21, 2013 march at Frank Murphy Hall. Wayne County Circuit Court Judge Richard Skutt is hearing the Jones/Owens cases, with jury selection for Owens set for Mon. Oct. 28 and for Jones on Tues. Oct. 29. 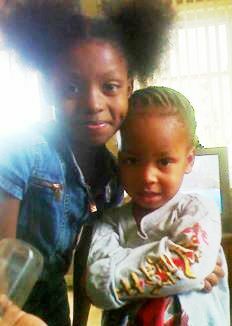 They are charged with killing Je’Rean Blake, 17, two days before Detroit police conducted a military-style raid on the Jones’ home, seeking Owens as a suspect in that case, and ended up shooting Aiyana Jones, 7. The two are co-defendants, but will face separate juries. Judge Skutt earlier barred Schlenkerman’s testimony against Jones, but the prosecutor appealed and Judge Skutt’s ruling was overturned at the state Appeals and Supreme Court levels. Jones has languished at the Wayne County Jail since Nov. 2011 awaiting decisions from the higher courts before going to trial. Schlenkerman and Owens were incarcerated at the Wayne County Jail Dickerson facility in 2011. Schlenkerman falsely testified at Jones’ preliminary exam in Jan. 2012 that he had been convicted of only one felony despite his actual record. 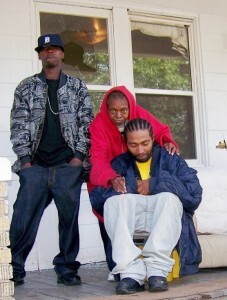 He then claimed that Owens told him in great detail that Jones had given him the gun to kill Blake. Jones was not charged until 17 months after Aiyana’s killing by Officer Joseph Weekley. Jones, Aiyana’s mother Dominika Jones and their toddler sons, grandmother Mertilla Jones, uncle Vincent Ellis, cousin Mark Robinson and great-aunt Robinson were present in the lower flat on Detroit’s east side as police, pouring from a military vehicle, tossed an incendiary grenade inside, stormed the house, and killed Aiyana with an MP-5 submachine gun. Aiyana Jones’ father Charles Jones is comforted by her great aunt JoAnn Robinson and cousin Mark Robinson the morning of her death; Mark warned cops children were in house. Chauncey Owens, Jones’ co-defendant, lived upstairs from the Jones’ family with his long-time fiance’ Krystal Jones, Aiyana’s aunt. Unlike daily media stories have said, he was not “hiding out” there when the home was invaded. It was his residence. Evidence at the Weekley trial called into question whether he was actually guilty in the death of Blake. His attorney David Cripps asked for a complete transcript of the Weekley trial file in order to defend his client. Owens refused to testify against Charles Jones repeatedly during the exam proceedings and was charged with contempt of court by 36th District Court Judge E. Lynise Bryant-Weekes as a result. Court records also show that Owens’ NEVER stated he gave Charles a gun, despite daily media reports that he confessed that in order to plead guilty to a second-degree murder charge. That plea deal was withdrawn after his refusal to testify against Jones, which resulted in Prosecutor Moran’s use of ‘jail-house snitch’ Schlenkerman instead. Chauncey Owens refused to testify against Charles Jones at preliminary exam. Weekley, who has been free on bond since Aiyana’s death, was charged with involuntary manslaughter and reckless discharge of a firearm. His trial resulted in a hung jury on June 18, after the prosecution appeared to deliberately undermine the case by failing to challenge numerous questionable statements and evidence produced by Weekley’s defense attorney. Weekley is scheduled for re-trial on December 4, 2013. Wayne County Circuit Court Judge Cynthia Gray Hathaway, who is hearing his case, admitted that she and Asst. Prosecutor Robert Moran wanted Weekley’s trial set after the Jones/Owens trial. According to Schlenkerman’s former fiancé, he has a history of functioning as a jail-house snitch, explaining why he is still free after 13 years of serious offenses. 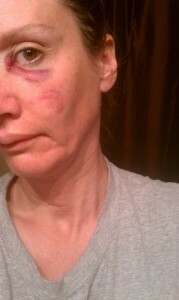 Police file photo of some of Schlenkerman victim’s injuries after he beat her in face with his belt. She said she was held against her will in her home for three days, that Schlenkerman threatened to kill her, and that he had raped her before. Brownstown Township police cited “kidnapping” in the first report they filed with Michigan State Police, but Wayne County Assistant Prosecutor Opolla Brown changed the charge to misdemeanor domestic violence. 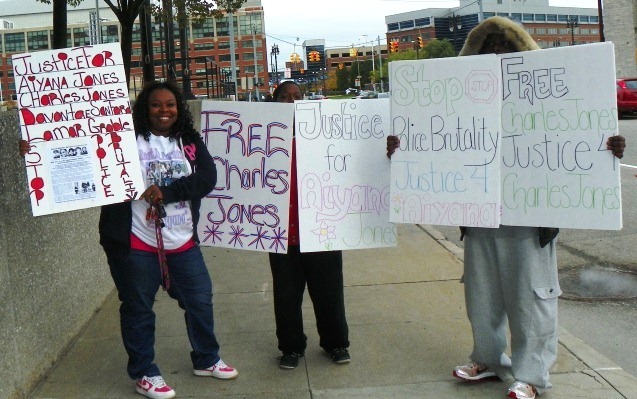 Members of the Jones family including Aiyana’s aunt Krystal Jones at left, during Oct. 21, 2013 protest.